4 Square has long been a popular recess and lunch time activity in schools across Australia. It’s an activity that’s easy to play and requires very little in the way of equipment, needing just a tennis ball and Grass Solutions Court Turf PE with line marking cut in for a 4 x 4, or 8 x 8 court. At Grass Solutions, we’re proud to be one of the leading 4 star grass suppliers in Melbourne. We’re called upon to create 4 square courts at many schools across Melbourne. If you’re looking for a quality provider of synthetic 4 square grass online, be sure to give us a call. As one of the best 4 square grass suppliers in Melbourne, our synthetic turf 4 square courts promise optimal performance for ball bounce when installed on a concrete slab or crushed rock base. Our court surfaces are typically 19mm sand filled synthetic grass. We individually tailor all line markings for each court, ensuring all are scaled to size. 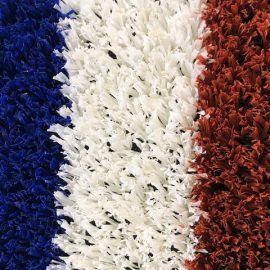 Due to their propensity to fade with time, age and weather, we never paint on line markings, instead using laser cutting for the most precise and long-lasting line markings possible.Grass is available in green, rust and blue, while line markings are available in red, blue, yellow and white. Wise choice for high usage/school installations. Highly suited to busy tennis court clubs, schools and commercial centres. 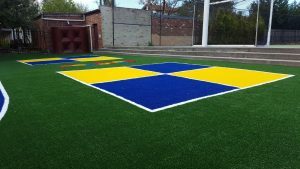 Why Not Have Your 4 Square Courts in Your School’s Colours? Grass Solutions 4 square synthetic grass courts can be filled with colour or just have line markings for each court in colour. To discuss your needs with the leading 4 square grass suppliers in Melbourne, contact Grass Solutions today.